Live the Dream! Stay at Tennessee Dreamer for your next Smoky Mountain getaway and you'll be living the dream - Tennessee style! This custom crafted 5 bed, 4 bath cabin has room for up to 21 guests to spread out on 3 levels of luxury living. Wrap around decks and ramps between the main and lower levels connect the outside to the inside so the mountain view can be enjoyed from everywhere! Large windows and glass doors bring the mountains into the vaulted living room with stone fireplace. An over sized dining table opens to a fully equipped kitchen for preparing your favorite meal. Bring your movies - a home theater with stadium seating adjoins the game room with arcade games, pool table, & foosball. Upstairs, the loft even includes an air hockey table! 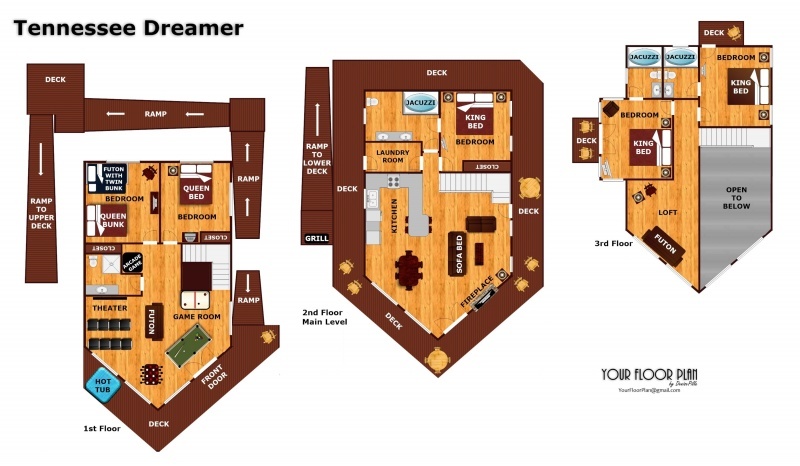 Log beds, LCD TV's, and lodge style furnishing add up to make staying in TENNESSEE DREAMER one "dreamy" experience! Call today to reserve your next Smoky Mountain getaway in TENNESSEE DREAMER! It was a great 1st time in a cabin in the mountains. My family loved the experience. Thank you for the moment. We had 9 people staying here and there was plenty of beds and rooms. The scenery from the cabin is outstanding! Lots to do in town and close to Gatlinburg. Would definitely recommend this cabin and company. Tennessee Dreamer was perfect for our family getaway. Lots of room and plenty of extras to keep everyone busy. The media room was great for watching our team play during March Madness!!! We had 6 vehicles and no problems parking. We will absolutely recommend American Patriot Getaways to all our friends. The cabin was wonderful and we thoroughly enjoyed our stay! My family and I absolutely loved our stay in The Tennessee Dreamer! I honestly could have stayed another week. Our stay in Tennessee Dreamer was great. Cabin was spacious and views were beautiful. This was an amazing cabin, it was absolutely beautiful. Everyone had a great time and hated to leave. I just can't say enough how much we enjoyed ourselves staying here and how spacious, clean and great this cabin is. We will definitely be staying again but longer next time.Thank you for having this cabin available for rental. Thank you APG! Great cabin. Would not go to same cabin again just because I like to stay in different ones each time. we had an amazing time at the cabin, we were very happy with it.we plan to come back and stay with you. It was a fantastic vacation from the very moment we arrived. We enjoyed the cold mountain air and the snow that arrived the morning we left. The staff from APG's were great with all of the assistance we required. Yes we would definitely return to APG's and the same cabin again. It was BEAUTIFUL !!! Our group was very pleased with the experience we had with American Patriot this weekend. While there we started planning another getaway for next year and thought about riding around to see if we would rather have another cabin when we go back, but everybody loved the Tennessee Dreamer so we have decided to stay there again next year. The view was amazing!! I think this cabin had to have the best view up there. Thanks! We had a great time and will be back again. As a group we loved the cabin, the game machine had games i didnt know but they were easy to figure out. I love staying with APG.